What is reflexology? F about the benefits of reflexology here. Reflexology or zone therapy is one of most successful forms of alternative medicine ever practised and this is true even in 2016, 2017. It can provide you instant relief from pain simply by pressing the certain pressure points. Find the right techniques to practice reflexology on self along with Shiatsu massage for maximum benefit. Just choose your ailment to get started with learning about reflexology using this simple step by step guide / app. Reflexology and Shiatsu massage are very good forms of "touch healing" therapy that a person can practice on their own for immediate and long term relief from chronic and acute pain. This involves applying pressure with the thumb and fingers and activating the reflex points that are responsible for proper working of the whole body. 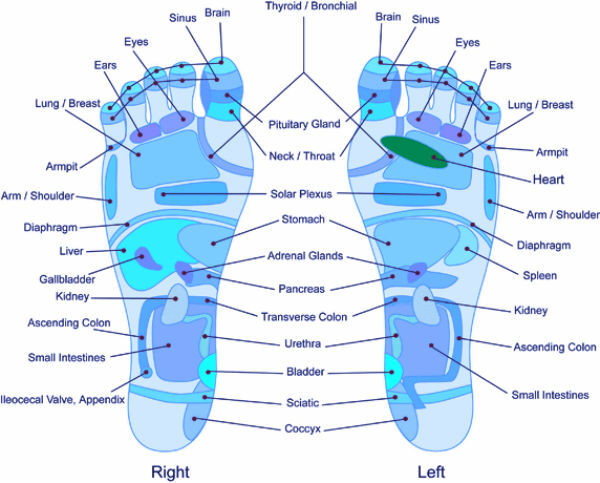 Below is an example of Reflexology Chart for the feet. A reflexology hand and foot chart shows the exact points which control the different parts of the body, muscles, glands and organs. Pressing the right points can heal and cure you. Shiatsu is a Japanese technique of therapy using finger pressure. Both these forms of alternate healing can help in better blood circulation, thus providing you with long term healing. Get your personal reflexology tips and advice with this free online reflexology hand and foot chart.